Our villas are set in the countryside where you can appreciate the slow pace of life and views of the olive groves and vineyards. A hire car allows you the freedom to explore further, including the nearby town of Martina Franca where you can enjoy a meal, sightsee and pick up essentials and a few local delicacies for your villa holiday. 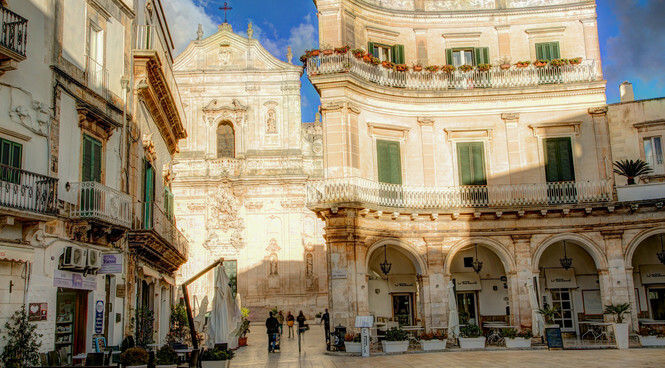 Martina Franca has a weekly market each Wednesday morning. Local farmers bring their seasonal produce to see so you buy cherries in spring, fresh vegetables in summer and figs, chestnuts and almonds in the autumn. There is a supermarket for basic supplies for your villa and smaller bakeries, butchers and other specialist shops which are open at certain times of the day. In the historic centre, you can find a variety of boutiques. One of the oldest cafes in Puglia, Caffe Tripoli is located on the Piazza Maria Immacolata and has several pavement tables perfectly situated for people watching. It’s renowned for a local cake called bocconotto ricotta e pera. There are plenty of other restaurants and cafes serving Italian specialities like capocollo, a spiced sausage made in the town. From Martina Franca, you can drive down to the Adriatic Coast with the closest beaches being around Torre Canne, where you can choose between the public beach or a private beach club. You can hire sunbeds for the day at the beach clubs as well as lunch at the onsite restaurants. The public beaches often have limited facilities so you may want to pack a picnic. For a fun day out, head to Fasanolandia, about 30 minutes’ drive away towards the coast where you can visit the zoo and enjoy the rides in the theme park. 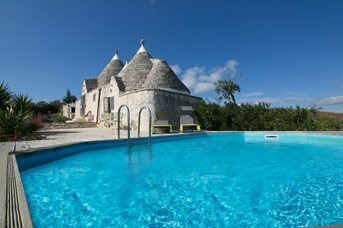 Closer to Martina Franca, just a few miles from Alberobello is a smaller water park, Acqua Park Alberobello which is more suited to younger children. In the centre of the town, you’ll see many fine buildings and elegant squares. The Basilica of San Martino is the town’s main church and is highly decorated inside and outside. The Palazzo Ducale is a large palace which is split between the council offices and a museum where you can see the elaborate Baroque frescoes. Grottaglie, a town famed for its ceramics is within 40 minutes’ drive and you can visit the workshops in the Ceramic Quarter where the potters produce a wide range of table and homeware.